Shane Harris and Nancy Ybussef at the Daily Beast offer a piece on the intelligence analysts who claim senior officials have pressured them to cook the books on the ISIS threat. Senior military and intelligence officials have inappropriately pressured U.S. terrorism analysts to alter their assessments about the strength of the self-proclaimed Islamic State, three sources familiar with the matter told The Daily Beast. Analysts have been pushed to portray the group as weaker than the analysts believe it actually is, according to these sources, and to paint an overly rosy picture about how well the U.S.-led effort to defeat the group is going. Reports that have been deemed too pessimistic about the efficacy of the American-led campaign, or that have questioned whether a U.S.-trained Iraqi military can ultimately defeat ISIS, have been sent back down through the chain of command or haven’t been shared with senior policymakers, several analysts alleged. In other instances, authors of such reports said they understood that their conclusions should fall within a certain spectrum. As a result, they self-censored their own views, they said, because they felt pressure to not reach conclusions far outside what those above them apparently believed. 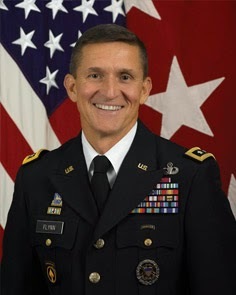 “The phrase I use is the politicization of the intelligence community,” retired Lt. Gen. Michael Flynn, (seen in the above photo) the former director of the Defense Intelligence Agency, told The Daily Beast when describing what he sees as a concerted push in government over the past several months to find information that tells a preferred story about efforts to defeat ISIS and other extremist groups, including al Qaeda. “That’s here. And it’s dangerous,” Flynn said.